"Grooming and nutrition contribute to dog hair texture and condition. There are many diseases that can result in a dog losing hair, with most causes of unknown origin. A list of the most common reasons is listed below. Some canine hair loss may be due to genetics, breed disposition, history of physical injury or excessive grooming. All dog skin lesions that accompany hair loss, and any canine hair that has a bad odor and is accompanied by itching or scaly skin, needs to examined by a veterinarian." If you are having a canine health hair problem, then proper grooming and understanding why your dog may be shedding or losing hair can be helpful. Reasons for your dog hair problems can be breed specific, temporary, or require removal of the underlying cause. Regular brushing and combing will keep your dog's coat clean and avoid matting. Start grooming your dog's at a young age in short sessions to get them used to it. If your dog resists when brushing legs, try doing it without holding onto the leg or keeping it from moving, it is the lack of motion control that makes most dogs object. Before brushing consider something that takes away the static electricity from the coat such as an anti static conditioner. The hair should not stretch when combed. The best brush is for all types of dogs is a pin brush. An alternative would be a slicker brush with soft to medium bristles. Long Hair Dogs: Strokes should be short, never pull, and brush in short strokes against the direction or lay of the hair pushing it up and then push the sections down. Short Hair Dogs: Brush in the direction of the lay of the hair. Start at the head and work back. Do not use human shampoo on dog hair as it is too harsh. A good choice for everyday care is Kiehls For Your Dog shampoo and conditioner or Manage Mites Shampoo. Most dogs only need to be bathed once every 2 months in the winter, and 1x to 2x in the summer. Ideally a shampoo should be formulated for your dog's skin and hair. In term so conditioners, use the type that is rinsed out after shampooing. Use a type that stays on your dog for an indefinite time in between baths during brushing to prevent any hair tangling. Opt for products that are all-natural and fragrance free. This is an immune mediated skin disease. Your veterinarian may take a small skin sample for analysis. Symptoms include the loss of hair in one or patchy areas. Treatment is either to wait for hair regrowth or to try corticosteroid injections. This happens when your dog loses hair on the sides of the body and then regrows it months later. Symptoms include the skin appearing black in color. If your dog has been neutered or spayed and other illnesses such as those mentioned above have been ruled out, then you can try therapy with Vitamin A and oral Melatonin which is a synthetic hormone. You can buy Melatonin at any health food store in 3mg tablets or online by following the link.. The dose is daily over 2 to 3 months with results seen in 6 to 8 weeks. Over time reduce to 1x per week. Melatonin helps approximately 50% of dogs. One side effect may be sleepiness. Be sure to check with your veterinarian first. The reason for a dog losing ear hair (see breed specific information below) can be caused by a thyroid problem or parasite such as mange. Dog hormonal problems such as (hyperadrenocorticism), hypothyroidism either require hormone therapy or surgical removal of the problem gland. Problems include hypothyroidism or Cushing's Disease. Symptoms of this problem include loss of hair on your dog's body. You may also see irritation, skin bumps, blackheads and flaking. Ringworm (fungal infection) and bacterial infection can cause hair loss. Hairless patches are up to 2 inches in diameter. A canine lick granuloma (acral lick dermatitis, ALD), causes raised skin ulcers on the front or hind legs. The licking causes the lesions, hair loss and possibly skin infection. Treatment often involves the use of corticosteroids and antibiotics for infection. Dog skin allergy should also be suspected as it is a common cause of dog paw licking. Other possible causes are a bone tumor, skin infection, ringworm, a foreign body in the skin, mange or an endocrine disorder (hypothyroidism, hyperadrenocorticism). Shampoo therapy with a benzoyl peroxide based product such as DermaPet may be helpful. Prescription medications such as a topical ointment may also be needed, although the problem is that dogs might lick it off. Focus is on proper nutrition, natural supplements and fish oil supplements. It is possible for dog's to become bald, particularly around the ears. (see information below by breed). The mind can have an effect on health and dog hair loss. Some problems such as excessive licking can have a psychogenic or mental component. Other problems can include mutilation disorders, and obsessive compulsive disorder. For these, therapy can include behavioral medications or a homeopathic that calms such as Pet Calm. Dogs may self mutilate in reaction to attention seeking behavior, boredom and separation anxiety. Here other homeopathics such as Epic Spray is a natural remedy for pets that is formulated to relieve separation anxiety, depression, loneliness and sadness. Refers to a condition where there is permanent damage to the hair follicles. Possible causes include chemical exposure, physical problems, heat, bacterial skin infections, skin tumors and auto-immune diseases (allergy). Usually this is caused by a short term problem or stress. Once the reason is identified and eliminated then the problem goes away. In some cases such as plush coated dogs, hair will regrow in 6 to 12 months. Refers to hair loss all over the body due to stress, illness (canine cancer medications can cause hair loss), high temperatures, pregnancy or lactation. Hair loss is sudden followed by re-growth 2 to 3 months later during the next hair growth cycle. Tumors on the testicles or ovaries can cause hair loss. The prognosis is excellent if the ovaries or testicles are removed. These issues cause hormone problems which lead to hair loss. Certain breeds have a higher incidence of dogs losing hair. The following table lists breeds that have this problem, and the reason for the problem. Some breeds such as Greyhounds can lose hair on their thighs which later grow back. After 3 years of age some Dobermans (blue Doberman) and Irish Setters (fawn color) can lose hair. Symptoms may include some irritation on the skin. You can help the skin with a medicated bath. High incidence of dog pattern baldness. There is no known treatment. Clipping the hair can stop hair growth temporarily. Hair loss in one color. Seen mainly in the head and neck area. Boxers can see hair loss on each side of the pre-pubic area. 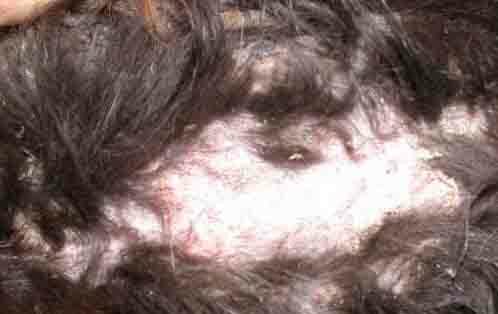 Canine pinnal alopecia (dog losing hair around ears) is a condition where hair loss begins after 1 year of age and continues until a dog is losing all hair at age 8 or 9. Treatment includes thyroid therapy and the use of testosterone (males). Cocker Spaniel hair loss occurs at the ear margins. Miniature Poodles get periodic dog ear hair loss (alopecia) where tufts of hair fall out. Hair regrowth occurs on its own after a few months. If your dog is losing hair around the eyes then your pet is suffering from demodex mites, a condition otherwise known as dog mange. To treat mange consider a treatment such as Naturasil for Pet Mange. The same company makes Benzarid which is an all natural way to rid your home of the mites. Dog smell is not caused by just one odor, but is a combination of odors. The odor become strong and combine when a wet dog's hair is brushed. The odor is caused by a chemical reaction between the hair and the water, causing a range of odors. Smells that develop include sulfur, medicinal or feces, mushroom, fruity, floral, earthy and branched or complex aldehydes. It is this last category that increases the most when the hair is wet. If your dog suddenly has an itch, is losing hair and smells then your should bring her to the veterinarian to check for infection (bacterial, fungal etc.). Dog hair is made up of 90% protein. It is essential that your dog's diet contain enough protein to help the skin and hair stay healthy. The other important component are amino acids. If you suspect diet is the problem, then consider gradually changing your dog's food to another product. If your dog's skin appears dry consider a food like Hill's® Science Diet® Adult Sensitive Skin dog food. Also consider supplementation with an omega-3 fish oil supplement and a herbal remedy designed to support the skin such as PetAlive Skin and Coat Tonic for Healthy Skin and a Glossy Coat in Pets. All dogs shed hair. The difference is the amount of hair being shed and the frequency. On all dogs, as new hair grows it will push out old hair causing shedding. Shedding will increase as the days get shorter and then slow down as it gets light longer. Of help might be our guide to the best dog hair vacuums. If your dog's hair appears unhealthy, dull or brittle then consider some of the products mentioned above and see if the problem of dog shedding hair improves over time.